This Condo is located on Paugus Bay in Laconia, NH. The property includes a waterfont property with a private beach. Your private deck has a grill for BBQ. It is ideal for 2-4 people. The first floor of the condo is comprised of a deck with sliders, living room, pull out sofa with full kitchen, along with washer and dryer. The second floor has 1 bedroom and bathroom, the dÃ©cor is very tasteful. This location also offers A/C . Please read below for more details. 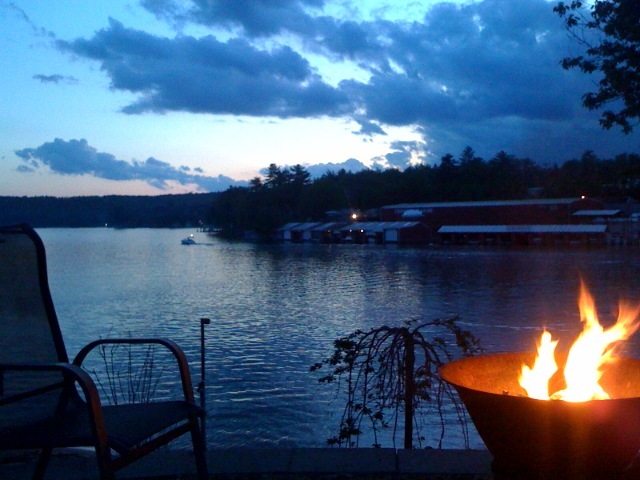 Stevens Cottage Rentals of New Hampshire waterfront condo vacation rental, is available for Spring, Summer and fall. Click here to take a virtual tour of this property! Bring your motorcycle and take a ride and enjoy the beauty of New Hampshire’s back roads . Entertainment is right next door at The Naswa Beach Bar you can watch the live bands directly from the deck of the condo. Across the bay is the marina with boat and jet ski rentals. This location is in the heart of everything. Walking distance to the strip at Weirs beach. THIS LOCATION IS THE PLACE TO BE ON BIKE WEEK! CALL FOR PRICING. Click here to setup your next vacation! The kitchen can accommodate 2-4 people. It is fully equipped with the following items and more: utensils, dishes, glasses, ice tray, can opener, pots and pans, stove, refrigerator, sink, microwave, dishwasher, washer and dryer. New shower, toilet, vanity, mirror, shelving, - clean! Queen bed, flat screen TV w/ cable, bureaus and picture window to enjoy the view. Flat screen TV w/ satellite cable, view of the bay - boats sail by often, pull out sofa, A/C, sliding doors to view, large deck faces the Bay and private beach. Parking for one car only, private beach, sitting area & BBQ area. We have two cottages that offer the ultimate in relaxation both offer great views of Lake Pemiguasett, good for fishing or sitting around with family and friends. >> Click here to read more. This vacation house is perfect for family or romantic getaways - Located on a beautiful wooded waterfront lot, featuring upscale amenities, excellent fishing, boating/jet ski. Relax with the family or friends, Includes features such as family room and bar for entertaining. Beautiful views of Sawyer Lake. Features upper scale two floors located right next door to Naswa beach bar and walking distance from Weirs Beach on Lake Winnipesauke. Geared toward a group of 2-4 people who enjoy outdoor activites and night life.